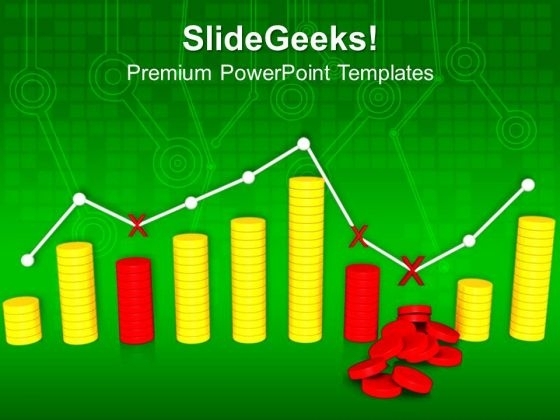 Graph With Business Fluctuations PowerPoint Templates And PowerPoint Themes 1012-Emphatically define your message with our above template which contains a graphic of stack of coins with business graph showing fluctuations. This image represents the concept of business failure and success. Use this template for Business and Marketing purposes. The structure of our templates allows you to effectively highlight the key issues concerning the growth of your business.-Graph With Business Fluctuations PowerPoint Templates And PowerPoint Themes 1012-This PowerPoint template can be used for presentations relating to-"Graph with fluctuations, business, finance, success, marketing, leadership" On the face of it our Graph With Business Fluctuations PowerPoint Templates And PowerPoint Themes 1012 may appear quite simple. It takes a lot of effort to keep it that way. Some processes are difficult to fathom. Explain these aspects with our Graph With Business Fluctuations PowerPoint Templates And PowerPoint Themes 1012.